No. 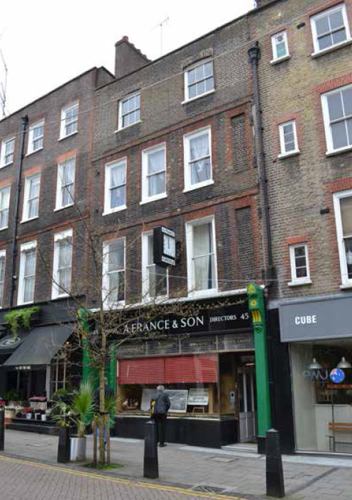 33 Lamb’s Conduit Street lies within what was originally the Bedford Charity Estate, founded in 1564 by Sir William Harpur1 (1496-1574) for the benefit of Bedford School. It was then 13 acres of open countryside; the neighbouring fields included conduits that supplied water to the City of London. One of these was Lamb’s Conduit, financed in 1577 by William Lamb, who also provided 120 pails for poor women. He was a chorister of the Chapel Royal and a member of the Clothworkers’ Company. The Bedford Charity (later Harpur Trust) Estate was developed from 1684 by the speculative builder Nicholas Barbon (ca.1640-98). Barbon was an influential figure, responsible for some of the largest speculations of the time (including Red Lion Square, nearby). He began with Bedford Row,2 the west side of which was complete by his death in 1698 (some of these houses still survive). 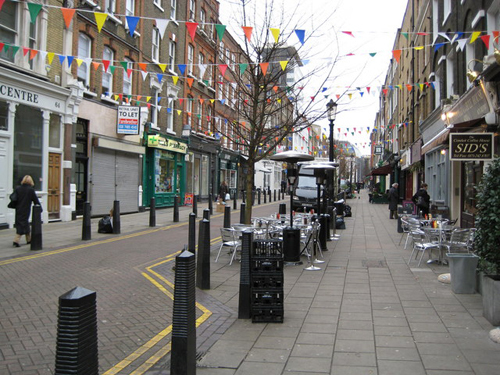 Lamb’s Conduit Street, which follows an old route to Lamb’s Conduit, was projected by Barbon as early as 1688, though, owing to market conditions, was not built up until ca. 1700-15. 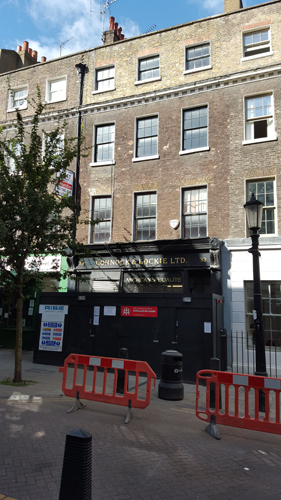 The only houses on Lamb’s Conduit Street surviving from this original phase are to the north of No. 33, within the neighbouring Rugby Estate (e.g. No. 45). No 45 Lamb’s Conduit Street (ca.1700-15). houses, Nos. 29-37 (odd) survive today, but there were originally a further thirteen of matching design to the south. The consistency of design is apparent from John Tallis’s London Street Views (1838-1840). The house is Grade II listed. I had been asked to assist with the selection of appropriate paint and colour for the building. 1Harpur had been Lord Mayor of London in 1561. After the Reformation he had re-founded Bedford School and endowed it with 13 acres of hunting land in Holborn. 2I have worked on two houses in Bedford Row – No.8 and No.13. 3Nicholas If-Jesus-Christ-Had-Not-Died-For-Thee-Thou-Hadst-Been-Damned Barebone (who traded as Nicholas Barbon) was an economist, physician, and financial speculator. His unusual middle name, given to him by his strongly Puritan father, is an example of a hortatory name: religious “slogan names” were often given in Puritan families in 17th-century England. This has borrowed heavily from a report produced by Alan Baxter, which in turn, credits an unpublished report written by Frank Kelsall in the 1970s for the GLC Historic Buildings Division.